You read a headline, and full of anticipation you click through. But the article is disappointing. Superficial. Without substance. As a writer, it’s a scary thought. Could it be that our precious words disappoint our readers, too? It’s hard to know. Because we don’t see readers yawning. We don’t see them clicking away. We don’t hear their deep sighs of disappointment because they feel they’ve wasted their time. I’ve written a lot about polishing your writing. All that editing is a waste of time if content lacks substance. You can’t transform flaky content into enchanting articles, just like a master diamond cutter can’t transform an ordinary piece of rock into a sparkling diamond. When does content lack substance? Substance is not about writing longer articles or sharing more ideas. Often long articles are impoverished—with too many superficial ideas, and lacking direction. Substance is about the depth of your arguments. It’s about the insight you offer your readers. Even an email of 100 words can have substance. A nugget of wisdom. A super-practical tip. A spark of inspiration. Substance is about adding value, exceeding your readers’ expectations, going beyond the echo chamber of online content. If you’re not adding value, you’re taking up space. The more space you take up, the more difficult it becomes to continuously earn your spot, and the more likely you are to become ignored and irrelevant. Last year, I heard Sally Hogshead speak at the Authority Rainmaker conference in Denver. Sally is an expert in fascination, and I was curious to find out which presentation tricks she used to fascinate her audience. When I compared her presentation to others, I noticed one key difference. Sally’s presentation was multi-layered—she used different types of information to fascinate her audience. She told stories about her life and career. She shared stats and graphs, but also colorful pictures. She put theory into practice with real life examples. She made bold statements, shared tweetable soundbites, and gave us practical advice. Sally’s presentation stood out because she weaved all these tools into one coherent presentation—to communicate her message of becoming fascinating by being ourselves. Each information tool added depth and insight. I realized I could improve my writing by using the same multi-layered approach. By inserting different types of information into my articles, I could make my content more substantial and more fascinating. Step-by-step instructions are often the cornerstone of valuable content. But explaining how something should be done is not enough to hook your readers and keep them reading on. First you need to explain why people should care about your instructions. What will they win from following your advice? Promise readers a solution to their problem, and they’ll be curious to learn more. Reveal your secret strategy. Allow them to master your fool-proof method. Share your tips, tricks, and techniques to make their life easier, better, or happier. Be careful, though: Don’t over-promise. Because that’s a sure-fire way to disappoint your readers. But it’s been a mistake to ignore numbers. They add substance to an argument. They show you know your field. They instantly make your content more factual. They boost credibility and appeal to rational thinkers. Good journalists often use stories to hook readers, and then include stats to back up their argument. Try using a quote from a well-known expert instead. A quote demonstrates you know your field, and others agree with your views. Keep an eye on expert content and create a file of valuable and fascinating quotes. If you use Evernote, tag your quotes, so you can quickly locate suitable quotes for an article. Perhaps you’re intensely private and don’t like sharing personal stories online. Or maybe you feel personal stories don’t belong in business blogs. But that’s wrong. In this world of content overload, it’s the personal stories that connect and engage—they humanize your content. They help you bond with your readers. Don’t share a personal story for the sake of being personal. Use a personal experience to add value for your readers. Examples instantly add substance to your content because you translate theory to practice. Examples breathe life into your content by making abstract concepts concrete. Readers can visualize your ideas. Use one example to illustrate your point—like a case study. In my post about Apple’s copy, for instance, I analyze in detail why Apple’s copy is so seductive. Alternatively, use a series of examples, and comment on each of them to give your readers insight in what works and what doesn’t. My recent article with 47 headline examples, for instance, helps you understand what makes headlines seductive. Don’t wait with collecting examples until you have to write your post. Start collecting examples of topics you find interesting because it’ll speed up your article writing later. Have you been writing on automatic pilot? Feeling bored with your content? Rest assured, you’re boring your readers, too. So, challenge yourself. Find a new angle. Dig deeper. Experiment with a new tool. Content becomes more fascinating when writers are excited about sharing their own new insights. Don’t write purely for your readers. Write to deepen your own understanding, too. Who’s not afraid to make mistakes? Mentioning mistakes and explaining how to avoid them boosts readers’ confidence to implement your tips. You’ve written your step-by-step instructions. You’re proud of the details you’ve provided. You added a quote, a couple of examples, and a personal story. You’re sure. This post is good. Do readers really know what to do next? Can you nudge readers to take the next step? When I started writing, I knew how to be practical, how to arouse curiosity, and share common mistakes. The challenge for me was to include personal stories. I also have to make a conscious effort to add a quote or a few statistics. Once I started sprinkling a few stats, and quotes, and personal stories over my content, my articles became stronger. The comments and shares seemed to increase. And I became more pleased with my content, too. Which tool do you use most? Which tool do you use least? Which one can you add to your next article? Substance and style interact, strengthening each other. Your writing style charms readers with beautiful words and the rhythm of your sentences. But without substance, the most beautiful words remain empty advice. Substance is the real insight you offer. 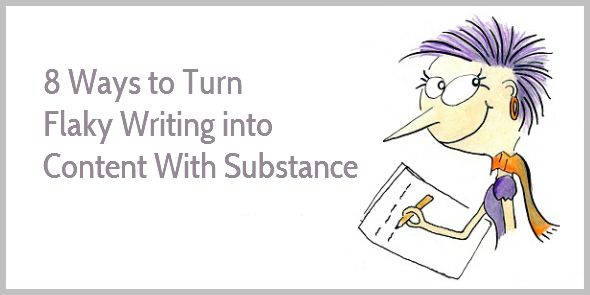 Substance helps improve your readers’ lives. PS This article was inspired by Sally Hogshead’s work on fascination. The idea for writing this post was sparked by a comment from Louisa Chan. Thank you. Hope you’re having a terrific Tuesday. What a powerful post this was. Thoroughly enjoyed it. I probably use the authority one the most. But I clearly want to change that to both the stories and inspiring action. I’ve changed my writing style to writing more actionable content, but I still know the importance of including all these things you said. Especially the personal stories. I found when I sprinkled some of that in my content in the past, people enjoyed it more. I’ll make a conscious effort to include those more. Really great job here, Henneke. I think we all have personal preferences. Some people prefer using quotes and stats. And others are great at telling personal stories. But when we mix our tools, our blog posts become more powerful. Very useful advice for all writers, not just marketing types. Thank you. And you’re right – this works for any type of non-fiction writing. Sure, substance makes a style statement. And graphics are indeed another way to add substance—as long as you don’t use them simply for decoration. As per usual, you provide helpful value-add suggestions. Thank you. Funny thing is, I have noticed that I battle to “paint pictures” in my writing. It can take some real practice. I will be adding your suggestions to my future content creation! From avoiding adverbs to writing with substance, i’ve come to learn that there’s indeed no standard guide to writing great content. All of what i see on the web are simply guiding principles; some good, others bad, and most…. worse. This is great, going into my catalogue of “Writing Guiding Principles”. Thanks for such an amazing guiding principle. Yep, you’ll find an abundance of writing guidelines on the web. Some are good, and some are pretty useless. So go for the guidelines that feel practical and for the resources that have build up some credibility. Volunteering to help with marketing and fund-raising for a local non-profit. Our first meeting is this afternoon. Sent this article out to the attenders and will take a highlighted copy with me to the meeting. Good timing and a great lead-in for our planning meeting. Love your work! You are so totally awesome. Sorry to be sort of vapid with my appreciation, but it is sincere because I do like to read your work. One thought is that this article may need re-numbering. I would think that ‘surprise yourself’ would be first; then share common mistakes might fit into two; and inspire action belongs with six; clarify with examples might be three; perhaps four would be arouse curiosity; five might be add numbers; inspire action might be seven; and that leaves borrow authority for eight. You’re not vapid at all! Thank you for your compliment. And yes, the order could be different. I wanted to have “inspire action” as last because inspiring action is often the aim of the final paragraph. I appreciate your suggestion! Yes, I got a little nervous wondering whether my article would have enough substance! By the way, you don’t have to cover all the points every time, but it’s good to have a good mix on your blog. Thank you for stopping by again, Antoniya! My pleasure, Henneke, and yes, I realise that we must use common sense when adding substance, not just stuffing it in every article just for the sake of it. Be human first, right? Such a useful post Henneke. I am working on a presentation and found several ideas that I can implement and improve what I plan to say. Yes, Sally had a knock-out presentation. She had one big idea and wove those stories, facts, graphics, etc. around it.Thanks for reminding me. Thank you, Janet. And yes, I loved Sally’s presentation, too. Not just for her message, but also the way she presented. Remember the Jagermeister at 9am in the morning? Yes Jagermeister was so unexpected and it really got the audience involved. I have been trying to figure a way to do something similar but haven’t figured out how (yet). It is one thing to ask questions that the audience answers as a group . . . but to single out one person for an experience of drinking Jagermeister for the first time in front of so many people really was genius. Writing all these things down in paper. What a compiled list. I was surprised to see “share personal stories”. Definitely hard to do sometimes, especially when you’re shy. Yep, you’re right. Statistics often lie. They should be presented in an objective way, but that doesn’t always happen. “Substance is not about writing longer articles or sharing more ideas.” I agree. To me, substance is about a depth of understanding with a simple presentation that allows for practical application. You’ve once again clarified a misconception, Henneke. And thank you for including me in your article. I appreciate your taking the time to follow-up on my comment. Write on, Henneke. Inspire us with clarity! Thank *you* for your comment and inspiring this post. I see a lot of people writing so-called epic blog posts, thinking that all they need to do is making it as long as possible. But often those long posts are quite boring and unwieldy, and they often lack substance because there’s no clear message. Personal stories work pretty well to hold readers. I often observe your storytelling techniques and myself as a reader. I look at how your stories attract me. Then I try to use those techniques into my writing. What works on me surely will work on my readers, right? Yep, sure. That’s how I learned to write, too—by “stealing” the techniques that appealed to me. Ha ha ha.. you caught me. I’ve been using a few of these like numbers and borrowing authority, but I did not realize that I had a lot more colors on my palette that I could also use to paint a far more fascinating picture. Thank you for another insight! You took flaky and created an entire luscious pie of substance. 🙂 I agree statistics can bore if not folded in properly. They can also sour (too many food references? It’s lunchtime here). 🙂 I have seen too many articles/posts/headlines with what I call Twisted Sisters Statistics where the writer twists the stat to fit their scenario and misrepresent the numbers. Always enjoy your posts, Henneke. I hope you enjoyed your lunch! I just had dinner. You would have loved Sally’s talk , Tracy. I love the idea of presenting a problem and a solution. That’s really helped clarify my thinking when writing a blog. Thanks for an informative post. Yes, that’s the same for me. If I don’t have the problem and solution clear, then I struggle with writing a post. Evidence is so important to content. You have to back up what you are proposing. The personal connection is also a form of evidence, but more a bridge to that connection between the reader and the content. That’s why I used my own before/after photo in my Instagram article on must have photo apps. As soon as I started reading this post I thought how I could apply it to public speaking. In a few weeks I am giving a lecture about Chinese furniture. In the past I have been surrounded by pieces in my gallery that I can refer to. This talk is at a public institution so will be Powerpoint. I have been thinking how to spice it up – a multilayered approach with personal stories is a great way to go. Thanks for the insight. PS How do I get a photo loaded to replace the blank face? I’ve found that there are a lot of similarities between blogging and public speaking. Good luck with your lecture! I’m sure it’ll be interesting. Substance, methinks, cannot be taught. Or bought. Maybe not. But I’ll try! Dear Henneke, you keep fascinating me with your substance, your polished style., There is one thing that can be predictable with you. You always deliver articles that I learn from and grow from. If I could copy anyone in today’s world it would be you. Thank you for your lovely comment, Teri! I can see how this approach can be used to consciously layer an article, report, talk or training session with substance – with combination of all 8 layers or a pick of a few relevant layers. Love it and will be using it! With all this talk of cake – I off to put the kettle to brew a pot of tea. Lovely! Your metaphor reminds me of a rainbow cake – with different colors for each layer! I agree with using numbers, they add credibility and help you to backup your claims. I have used and still do wherever I have to. All are great tips, most of which I learned through my couple years’ of experience writing content. My writing has improved a lot through time, and mostly because I have learned to use the tips you’ve shared in this post. “if you are not adding value you’re taking up space.” Every time I read or reread one of your blogs I have more work to do. That’s a good thing right? The most visible and creatively structured point amongst all is how you engage the reader with your content. If it is flaky than it is upto the writer that how they can make the content interesting by grabbing the reader’s attention and making them stick to the topic. Very nice post and there are so many things that needs to be taken care of once you learn these tips carefully. Yep, that’s true. It’s always the fault of the writer if the reader isn’t engaged. And it’s hard work to engage readers, but it can be done. Thank you for stopping by, Mason. Thanks Henneke for your advice. I started my blog on journalism. My best article is the one I wrote following your advice attending a course of yours. I copied and pasted an article of yours on my document and I wrote my article following your rithm and structure. It was an article I liked a lot because it expressed my soul. Can it be a good way to write in a fascinating way? I didn’t copy the substance. Your style inspired me. Yes, it’s a great way to write a blog post—not copying the substance, but re-using the structure for your own blog post. It usually works best if you use an example blog post outside your niche, just like you’ve done. Thank you, Henneke. I agree that it’s more useful working with an article outside your niche. It’s incredible how a different topic with a structure that express your soul can strive your creativity. I was astonished how your article, about a very different topic, could inspire my ideas. I said to myself: “Oh my God, she writes about Copywriting and I am writing about investigative journalism and… her structure and her feelings reminds me a lot of past experience and ideas in another field”. Thank you for sharing your story, Maurizio. I appreciate it.